About 3-4 months ago, i was in Southern California at a relative's home visiting and they had another guest who was visiting from Tacoma, WA. (where my records are held) This lovely, wonderful person happens to also work at one of the City Offices! This person generously offered to help me in any way they could to speed up the search process! They have friends who are judges and lawyers and have acess to places I cant go! I have deliberately remained vague about this person becuase i want to be certain to protect them as they may be able to get me my adoption file! Its a funny and dangerous hope, but its a hope nonetheless! so just as a side note – i have a freaking 'in' that may lead somewhere. I'm not gettng too excited becuase they may not be able to do anything at all – but anything is better than nothing. still planning on making a trip to WA, just havent had time with the dissertation prospectus and everything. Soooo.. This is the letter I just recieved in the mail after sending off my non-ID request about a month ago. I heard it takes 6-8weeks, but maybe she said 6-8 months and I just didnt hear correctly. … tha hell? so until then.. do i keep searchin with the limited information I have or do i wait the 8 freakin months? i repeat.. gimmie my real birth certificate! Why should someone have access to my history and I am completely denied that same access when it belongs to me! This is very frustrating. There's a new free downloadable resource for anyone searching for 'lost' people. FREE!!! You can download a copy so you can look at it any time. It's full of search strategies, tips, and 'how-to's' to help you with your search. I've decided to post a bit of my Non-ID for my search angels and for the brothers/sister/mother who may be looking for me and might happen upon this site. 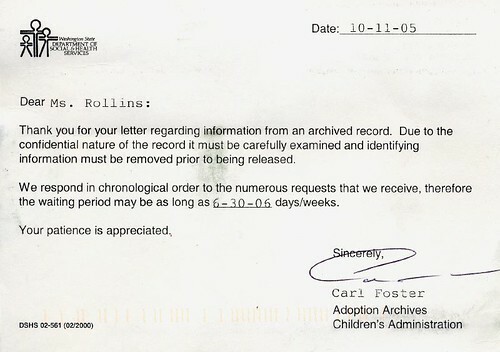 I have also posted information that I collected from my parents and the documents they kept. 3. Name was Lisa Marie when I was in the Foster Home, but no idea if this name was given to me by birth mother. 4. Adoption finalized in Pierce County. 8. I was the first child born. 15. I was in Valley General for 5 days.